VANCOUVER — The Vancouver Convention Centre is the first convention venue in North America to be granted corporate affiliate membership to the prestigious Les Clefs d’Or international concierges organization. 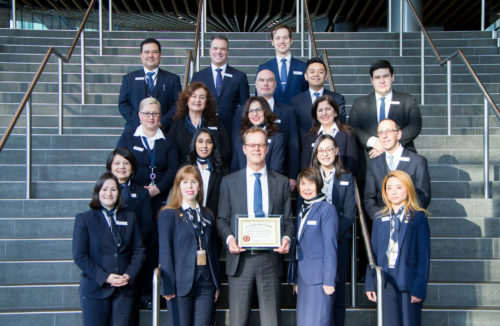 The local chapter, Les Clefs d’Or Canada, is a group of hotel concierges representing more than 4,000 top concierges in over 45 countries, including 150 Canadian members. Anchoring the convention centre’s service program is the Guest Experience Ambassador team that warmly greets guests; goes above and beyond to make guests feel valued; and provides event-specific services when required. Venue staff members are also destination ambassadors, providing direction and information about Vancouver and local attractions. Located on Vancouver’s downtown waterfront, the Vancouver Convention Centre features two connected buildings housing a combined total of 466,500 square feet of flexible meeting, exhibition, ballroom and plenary space. Each year, the double LEED Platinum-certified facility hosts 500-plus events. The not-for-profit association has been a member of Les Clefs d’Or International since 1976 and includes member sections in British Columbia, Alberta, Ontario, Niagara, Montreal, Quebec City and Atlantic Canada.